Thomas Bate of Challock held land in Challock and Nonington with which he made bequests during the reign of Henry VIII. “Landes given by Thomas Bate to thentent that one priest shulde celebrate masse within the said parishe iij (3) tymes yerelie for ever. Also: rent or ferme of v rods (5 rods or 1 ¼ acres) of land in the parish of Nonyngton next Harelestrete (Holt Street Buttes, now Butter Street) butts now or late in the tenure of Richard Mockett there, yerely ijs (2s) (previously owned by the Knights of St. John and confiscated by the Crown). Also: rent or ferme of i (one) and half acres at Frogham Hill there now in tenere of William Stuppell yerely xviijd.(18.d)”. The bequest of one and a half acres at Frogham Hill would appear to be the land believed given by William Boys of Tilmanstone in his 1600 will which gave two poor house keepers two houses, and an acre and a half of land; and a sack of wheat each at Christmas. Other sources state that the donor of this property was unknown. At the end of the 18th century Hasted wrote recorded that the annual revenue from the land, £5 10/-, was vested in the Reverend James Morrice, owner of Bettshanger manor. It is stated in Hasted’s History of Kent that a donor unknown gave to five poor housekeepers of this parish two houses and one acre and a half of land, at Frogsham (sic), with a sack of wheat to each housekeeper every Christmas, then vested in the Rev. James Morrice, owner of Betshanger (sic) manor, and of the annual produce of 5l. 10s (£.5 10 s). It is stated by J. P. Plumptre, esq., of Fredville Park, in this parish, that the property consists of two old tenements under one roof, with two small outbuildings east, and about a quarter of an acre of land adjoining, used by the inmates of the houses as garden-ground; that there also belongs to the charity a quarter of an acre of land, which has been for many years taken into Fredville Park, and for which the proprietors of the estate have always paid a yearly rent of 3l (£.3). 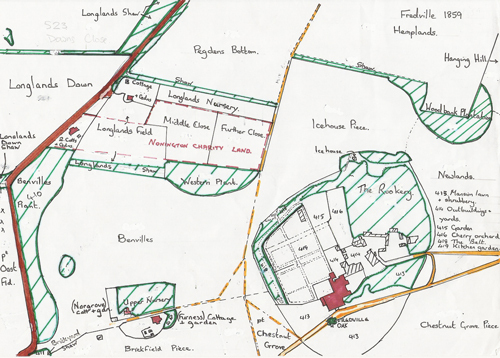 Also two small fields contiguous to each other, containing each about 1a 1r (1 acre & 1 rood or 1 ¼ acres), and bounded on every side by land belonging to Mr. Plumptre, who pays the yearly rent of 2l 2s (£2 2s) for each field. The patronage of these almshouses has for upwards of a century been considered as vested in the owners of the Betshanger estate, and it is stated by Mr. Morrice, the present proprietor, that in consequence of the charity-houses and land being situated in the midst of the Fredville property, an agreement was entered into with the late Mr. Plumptre, that he should fill up the vacancies, taking upon himself the annual payment of a sack of wheat to the tenants of the houses, a bounty to which they were entitled, as is supposed, out of the Betshanger estate. 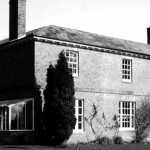 Two old labourers have been appointed to these almshouses from time to time by Mr. Plumptre and his predecessor, and they have received a sack of wheat or its value in money, and the rents of the three pieces of land before mentioned equally between them. The buildings are very old and dilapidated, and there appears to be no fund for the repairs, except by detaining part of the rents above mentioned for that purpose”. In Bagshaw’s directory of 1847 reports : ‘two old labourers have been appointed from time to time by Mr. Plumptre and £7 4/- is divided equally between the inmates as the yearly value of the lands’. In 1839 the tithe award schedule recorded William Young and others as living there, and the 1859 schedule Mary Burville and one other. The Charity Lands in 1859, from the parish tithe map. The land, now occupied in part by “new” cottages built around the time of the sale, the present Nightingale Cottages, was sold by consent of the Charity Commissioners to H. W. Plumtre in 1903 with four trustees appointed to administer the investment of the proceeds of the sale for such purposes as sanctioned by the committee. Other Nonington charities were mentioned by Hasted in his history of Kent, but Bagshaw’s Directory of 1847 stated that these charities are not recorded in the Charity Commissioners reports. The 1596 will of Edward Boys, gentleman, of Nonington and Challock, a son of William Boys, esq., of Nonington, which gave a 40/- (£.2.00) per annum annuity from 15 acres in Nonington and Barfreston to be paid annually to the poorest of the parish. Robert Barger, yeoman, of Bridge, gave to the parson and churchwardens of Nonington in his will of 1600 the rents and profits of his house in the parish for the relief of the poor of Nonington. The 1634 will of Sir Edward Boys of Nonington gave the poor of the parish the sum of £6 to be ‘employed for a stock to set the poor at work, and not otherwise to be employed, so as the overseers or any sufficient man of the parish be bound yearly to the heirs of Fredville, whereby the stock be not lost’.